Plaintiff’s Attorney: David W. Lipcon of Lipcon & Lipcon, P.A. J.D. was a passenger on a chartered fishing boat that sailed out of Miami. He was the father of two. There were approximately four (4) other customers of the charter on that day. After a long day of fishing, upon beginning the return to shore, the Captain turned the boat without reeling in the fishing lines. This caused the lines to fowl the propeller. The boat came to a halt. The Captain, instead of calling a repair, rescue or tow company, asked one of his passengers to go into the water to try to untangle the lines on the engine. He was unsuccessful. J.D. was then asked by the Captain to lay on the back landing of the boat, near the engine, to attempt to cut the line. He was untethered to the boat and was not given a life jacket. It was then that violent waves caused him to be thrown off of the boat. It was only at that moment that the Captain first threw J.D. a line, but it was too late. J.D was taken out to see by the waves and tide. After a long struggle, J.D. drowned. The family of J.D. hired David W. Lipcon to file a lawsuit against the charter and the Captain. After a year and a half of litigation, and after a week of trial, the case ultimately settled for 2.7 Million Dollars. 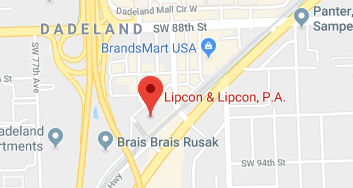 Mr. Lipcon made it clear from the beginning of the case that regardless of the jurisdiction (whether it was the State of Florida, Federal Admiralty/Maritime Law or the Death on the High Seas Act) Mr. Lipcon’s firm would stop at nothing to pursue justice on behalf of J.D. and his family.